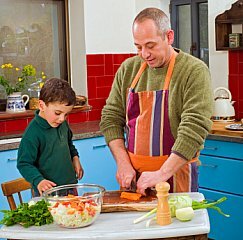 Fathers Day Recipes for kids to cook and/or help prepare. They say the way to a man's heart is through his stomach which makes finding Fathers Day recipes easy. And Dads are usually easy to cook for. Pick out his favorite recipe, whether it is cookies or a main dish and he will be happy to see the delicious work his kids have created. Some dads love to barbecue or grill. How about fixing the meal and letting Dad grill it or have Mom grill it and surprise Dad. Separate pizza dough into balls according to how many pizzas you will be making. One for each person is good. Roll pizza dough into a circle and brush with olive oil. Grill on both sides several minutes. Brush opposite side of dough when you turn it over. 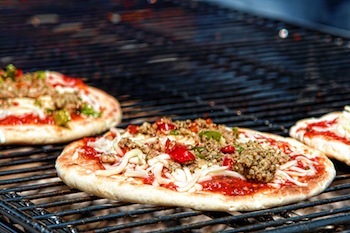 Place pizza toppings on pizza and allow to cook several minutes until warm. In bowl mix brown sugar, soy sauce, water, Worcestershire sauce, lemon juice, ginger and garlic. Stir together. Place chicken breasts in ziploc bag and pour sauce over chicken. Seal and place on a plate in the fridge. Marinade for several hours. Grill. Lay ribs in a roasting pan. In separate bowl add barbecue sauce, orange peel and juice together. Pour over ribs. Cover with tin foil and bake at 350 degrees for 2 hours. Uncover and bake additional 20 minutes or grill. 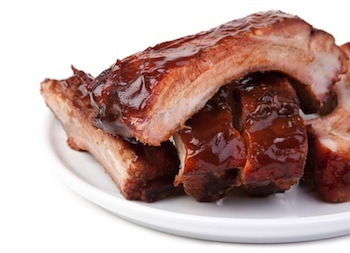 For a different rib recipe to use for a Fathers day recipe, see our American cooking page. This Fathers Day recipe goes great with a barbecue. Prepare in the morning and let them cook in the crock pot. In skillet brown hamburger, bacon and onion together. Drain and set aside. In bowl add together brown sugar, ketchup and vinegar. Add to meat in pan. Mix 1 can pork and beans, 1 can kidney beans (drained), and 1 can butter beans (drained). Add beans to meat mixture and bake 1 hour at 350 degrees. Or cook in crock pot on low for 6-8 hours or on high 4-6 hours. See our Breakfast in Bed recipes from Mother's Day. You can easily turn them into Fathers day recipes. Here is a cake recipe for almost every dad this Father's Day, whether it is homemade or a boxed cake mix is up to you. 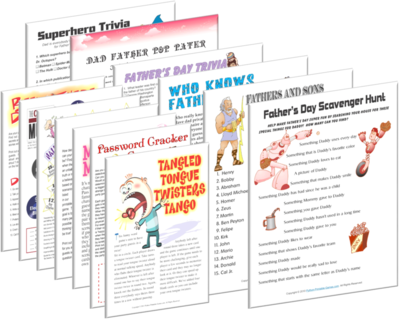 Some great Father Day recipes for kids cooking on Father's day. To decorate a ball cake, bake a cake in round pans. Allow to cool. 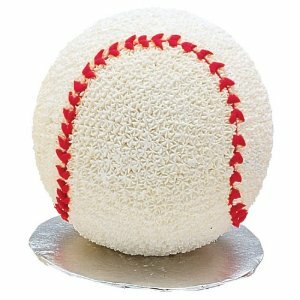 Decorate with white frosting and pipe red lines with the red frosting to resemble a baseball. 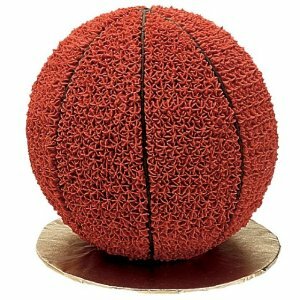 Or decorate with brown frosting to look like a basketball. There are several cake pans that you can make a 3 dimensional ball. Try a Wilton Wonder mold cake pan, a Batter Bowl from Pampered Chef or Betty Crocker's Dome pan. 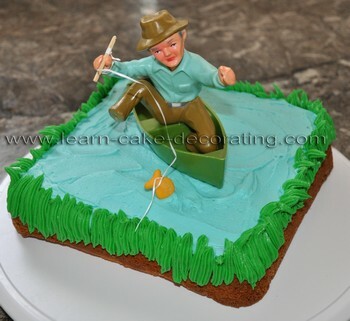 To make a fishing lake cake, bake a cake in a 13x9 pan. Allow to cool. Decorate half of the cake blue for the lake and the other half green for the grass. You can also make a circle in the middle to look more like a pond or lake. Add gummy fish in the lake. Use a toy boat or fisherman and give the fisherman a clean toothpick for a fishing pole. Bake the cake according to the directions in a 13x9 pan. Allow to cool. Decorate with green frosting to resemble grass. Place toy golf balls, golfers and golf clubs around cake. Bake a cake in a loaf pan or mini loaf pan. Allow to cool. Cover a round pizza pan with black construction paper and draw a race track with white chalk or white pencil. Take cake out of pan and place on a cutting board. Decorate car as you would like then with a metal spatula carefully pick up cake from the bottom and place on race track. Set 4 cookies on the cake for wheels on the appropriate place. If you have toy people or flags decorate the race track with them. Prepare a cake mix in a square cake pan. Use any extra for cupcakes for another time. Allow cake to cool and take out of pan. Place on a serving board. Paint top of cake blue to resemble a computer screen and the sides white. With your edible letters write or place a message on the computer screen. Back to seasonal ideas from Fathers Day Recipes.